We understand children and how the medical procedures make hospitalized children feel anxious and helpless, however, they could regain the power to combat disease and reclaim the joy of childhood through play. 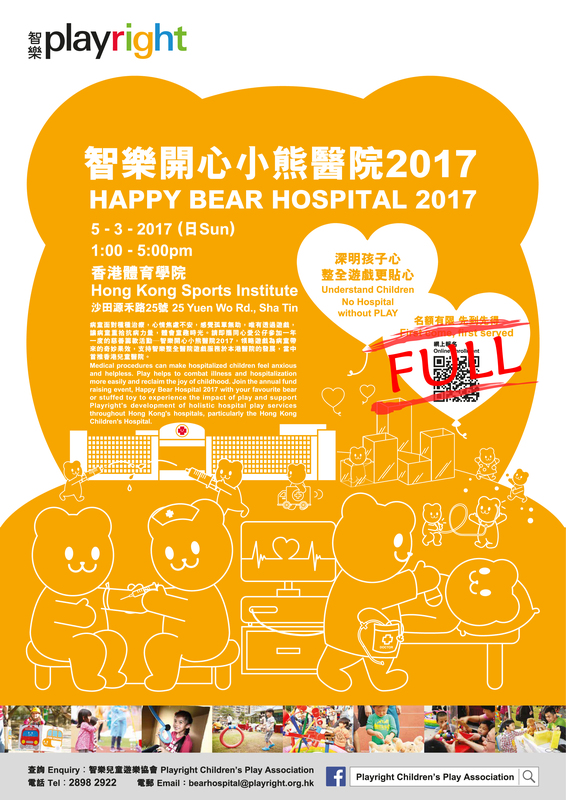 Join the annual fund raising event, Happy Bear Hospital 2017 with your favourite bear or stuffed toy to experience the impact of play and support Playright’s development of holistic hospital play services throughout Hong Kong’s hospitals, particularly the Hong Kong Children’s Hospital. Up to 4 family members, including at least 1 child aged below 18 and accompanied by parents; minimum donation of HK$650. Participant must be aged 18 or above; minimum donation of HK$250. We are full house and thank you for your support!